Here we are 3 days into Spring, and Pittsburgh thermometers read 38 degrees F, plus or minus. Most of the U.S. shares the same mood, popularized by those Heinz TV commercials, not long ago. A..N..T..I..C..I..P..A..T..I..O..N, there awaiting the tasty ketchup, born in this city and consumed nationally, and here, the retreat of wintry cold weather, and replacing that, beautiful moments like this one, Gray Hairstreak butterflies, nectaring peacefully on tall verbena perennials, Outdoor Gardens of Pittsburgh’s Phipps Conservatory…one of the greatest botanical destinations in the world. Verbenas are native to the U.S., though I’ll need feedback as to the origin of tall verbena. We’ve pictured this garden favorite several times before, noting how it is so easy to grow, produces flowers from June to October, and PUMPS nectar for just about that whole time span. Oh, and it is pretty, quietly, elegantly pretty. Strymon melinus is also a native butterfly, and it’s found across most of the United States. When fresh, like this instant one is, it is a gem, offering any who will lean in to examine it, a richly red patch with built-in black spot, against a fashionable gray fedora colored background, complemented by that tri-colored post median dash line, and those tails, those tails that often are moved this way and that. Heinz Ketchup, Yummy. The Phipps Conservatory Outdoor Gardens, Yummy. 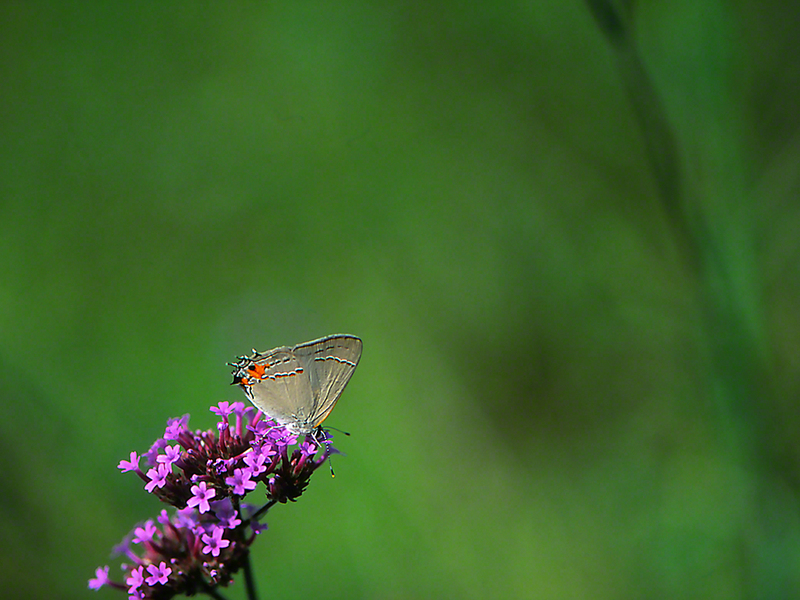 Gray Hairstreaks, Yummy. Spring and all of the above? Right, around, the corner. ← Who? What? Where? & When?